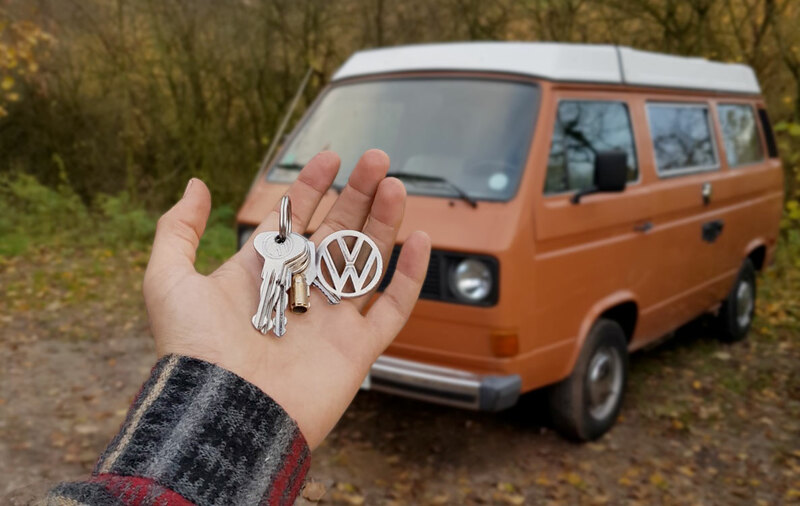 I came to own my first VW campervan in 2014 when I swapped my economical and reliable, 2005 Audi A3 for a beaten up, well-used 1987 VW T25 Transporter! It was a Leisuredrive pop-top conversion with a 1.9 ‘flat four’ water-cooled, petrol engine. Over the course of around 6 months, I had great fun removing the scruffy camping interior, fixing rust holes, insulating, soundproofing, fitting new carpet lining, amongst a host of other DIY jobs, before putting the freshly painted cabinetry and camping equipment back in. It served me well and over the next 3 years. I completed a 5,000-mile trip around Europe with my two boys (aged 1 and 4 at the time), enjoyed a two-week tour around Devon, Cornwall and Somerset and ‘wild camped’ the incredible North Coast 500 route in Scotland. The high mileage we did, eventually caught up with the old van and it resulted in a lengthy, and very costly, 6-month engine rebuild as well as a complete overhaul of the cooling system. 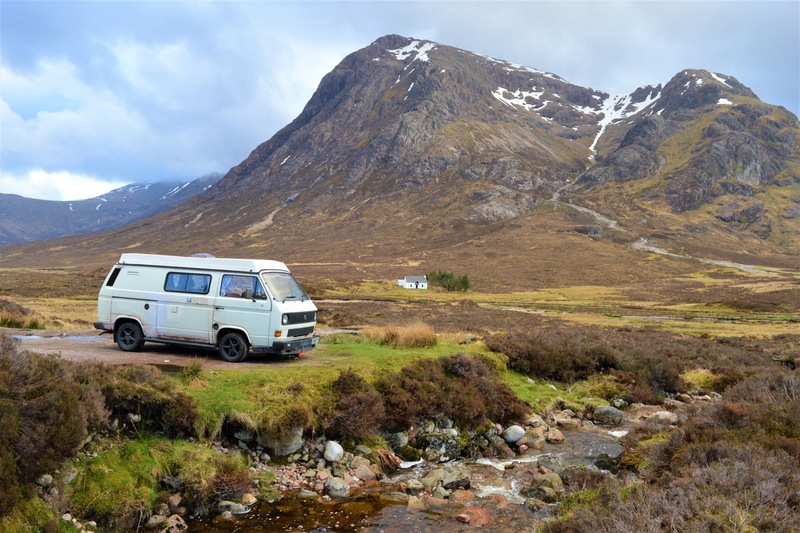 Combine this with my partner, Jenny’s, van (a 1985 diesel VW T25) – which also had enough issues to write a book about – and we were shelling out here there and everywhere on repairs and general running costs. We both knew that it couldn’t continue, so we sat down together one evening, added up how much we had spent on each van (something one should never do!) and mulled over our options, both of us reluctant to sell our campers that we had grown so attached to over the last 4 years. That was it, we’d made our decision! We were going to list them both for sale, pool our money together and buy a good enough camper that we wouldn’t have to ever spend money repairing again (that was the plan anyway!). We listed both vans on Gumtree in early summer 2018 and Jenny’s van sold in literally 12 hours and mine sold in a couple of days – we couldn’t believe it, neither of us had ever sold a vehicle that quickly before! My van went off to Cornwall to enjoy a surfing life by the sea and Jenny’s van went into storage for a young girl who hadn’t even yet passed her test! So, we’d done it, we’d put our emotions to one side and waved goodbye to our campers and we now had enough of a budget to find a special camper to cherish for the foreseeable future. We had done the difficult part, now it was just the simple case of buying a replacement – not quite as simple as we first thought! For our next van, we had a pretty clear picture of what we wanted. Our experience of water-cooled engines hadn’t been that great, so we thought we would try to eliminate this potential problem completely by looking for an earlier air-cooled van which uses the air to cool the engine rather than water being pumped round. My old van was not a massively popular conversion and Jenny’s van was a mixture of several different conversions so in order to have a van that is going to hold its value well, it needed to be one of the better-known conversions such as a Devon, Holdsworth or Westfalia. The main things we were looking for were good body work, a good engine and a van that has been kept as original as possible. The search was on, and so was the 2018 Summer heat wave! We knew what we were looking for and we were pretty confident that we would be able to find something in time to enjoy a few summer camping trips! Little did we know that this search would take months and months and see us spending hundreds of pounds travelling up and down the country. We started searching online classifieds and auction sites and we were initially quite shocked at the kind of prices people were listing their vans for even when they were visibly in pretty poor condition. It seemed were trawling through endless posts of vans with DIY paint jobs, non-standard parts and bodged interiors and questionable bodywork. Our experience of having owned and maintained two of these campers previously, quickly became invaluable. A couple of weeks into the search, we saw a sale post pop up on one of the VW T25 club Facebook pages for a ‘fully restored’ early 1980s air-cooled Devon campervan which looked like it was completed to a very high standard and to original specification. It seemed like it was exactly what we were looking for, so we excitedly contacted the seller. The only downside at this stage was that it was located in Cardiff – a fair old trek from our home in Derbyshire, but that didn’t bother us so much: for the right van, we were willing to travel. We were so convinced that this was the right van for us, that we put down a £500 deposit on the basis that if it was not as ‘immaculate’ as described, we would be entitled to the full return of the deposit. Such was the seller’s confidence in the vehicle’s condition, that he had no hesitation in agreeing to the terms. So, we paid the deposit and I booked the day off work and a one-way train ticket to Cardiff! On close inspection of the Devon camper, it was not at all was described. Luckily, I went prepared with a little magnet to check for filler and found that there were a few panels that the magnet didn’t stick to at all! The paint job looked rushed with drip marks and over-spray. There were obvious mechanical issues and the engine dripped oil as it was running. The seller couldn’t even tell me much about the restorer and only knew his first name, there was literally no history and the seller had only had it for around a year and couldn’t tell me anything about its past. Everything that I saw and heard screamed “walk away”! So I did. I walked away with a certain amount of disappointment and frustration but also a sense of relief that I had potentially dodged a bodge-job. I learnt a few lessons with the Cardiff incident: never hand over a deposit for anything until you’ve seen what you’re buying in person – I never got my deposit back! Secondly (and sadly! ), just because you’re in a VW club where most people have the same interests as you, doesn’t mean you can trust everyone in the club. And the most important lesson – treat keywords such as ‘fully restored’ with extreme caution! I wouldn’t say that I wouldn’t ever look at a restored vehicle again, but if I was to consider one, it would have to have been carried out by a reputable, specialist restorer with all the receipts for the work present. So, I was back home in Derbyshire, back at square one, checking social media, classifieds and auctions. A few weeks past with plenty of vans still for sale but not of the standard we were hoping for. The summer had properly kicked in now and all we could do was dream of being away wild-camping on a beach somewhere! A few more weeks past and we went to see a few campers that once viewed in person, didn’t live up to our expectations. We were starting to get conscious of the fact that we were spending a lot of time and money travelling around and everything we viewed was no good. 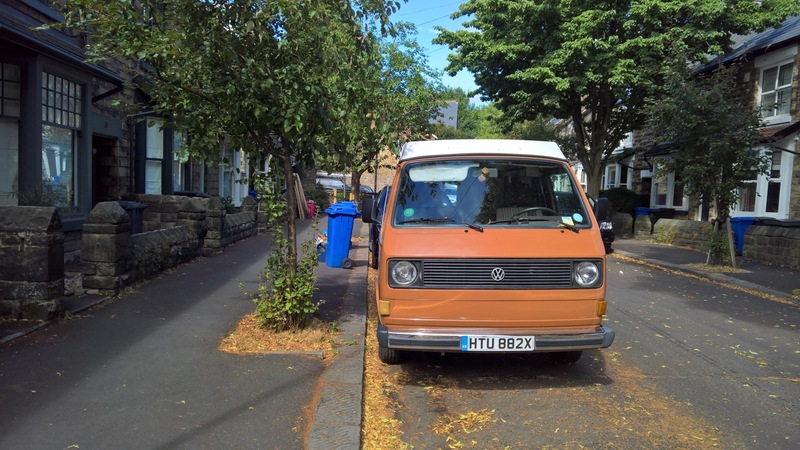 Then, one evening in July, I came across an interesting advert on Gumtree for a 1982 VW T25 Westfalia for sale in Sheffield. The listing was not very descriptive, and the photos were of relatively poor quality but because it was located fairly close to us and we knew what it was, then we felt it was worthwhile going to see it. We arranged to view it and spent about an hour looking over the van and having a chat with the owners. It had been imported from California in 2008 and due to the climate, it had lived in most of its life in the sun, the bodywork and underside of the van was one of the best I’ve ever seen. There were no rust spots or rot and the underside was as solid as a rock. The interior was all original but in need of some tidying up, but it was generally a solid, original and unmolested classic VW camper. We both made a note of the items that needed some attention, drew up a list when we got home, priced it all up and then made our offer. Of all the vans we had seen to-date, this was by far the best, so with our fingers and toes (and anything else that we could find) crossed, we waited for a reply! Unfortunately, our offer was declined, and the sellers were not willing to negotiate to where we felt the price needed to be. We made a final offer which was also rejected and once again had to walk away and continue the search. Things started to get a little quiet on the VW T25 market, our motivation was at a pretty low ebb too. I had signed up to pretty much every alert on every selling site online and searched night and day, using every tool I had available – even Google Earth! We moved into our home around 10 months ago and I remembered that the previous owner had mentioned that there was a farm nearby where the owner had a large collection of classic vehicles. So, I loaded up the laptop and sure enough, just a few fields down from us, I could see what looked like a graveyard! Vehicles were strewn left right and centre and there must have been around a hundred vehicles spread over a couple of fields around a large farmhouse. I did a bit of online digging and found that the building was registered to a company that imports vehicles from the States and then sells them in the UK. I found an email address and enquired as to whether they had any VW campers for sale on the off chance. As they say, sometimes you can be looking far and wide for something, only to find it under your very nose! Well, I received a response from the company saying that they had a couple of campers that we might be interested in and we could pop by any time and have a look! We went round a couple of days later and the lady of the house was very friendly and let us have a look around. The place was incredible! There were Jaguar E-Types, Triumph TR3s, Chevrolet 3100s and GMC pickup trucks amongst a host of other classic American vehicles. I was mesmerised, Jenny kept trying to talk to me and had to snap me out of the daze that I kept falling into – I may even have dribbled a bit! 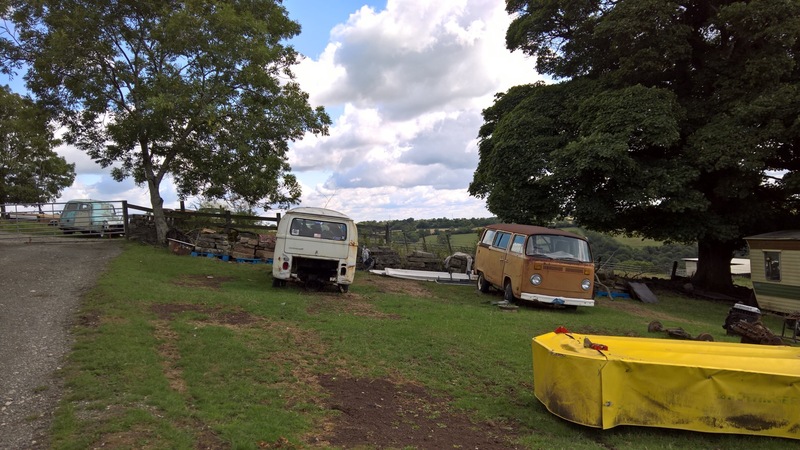 After a good look around, our attention was drawn to two 1970s Bay Window campervans tucked in the corner of the field, so we went over to have a look. They were amazing vehicles, with great sun-scorched patina but sadly, with no engines or interiors, so would have been far too much of a project – not what we were looking for at all. Though, I did feel tempted to scrap the VW idea and get myself a Chevrolet 3100 pickup truck and put a nice small-block V8 in it – but not so great for camping with the children! A couple of months past and we continued the search. An aircooled T25 Devon Sunrise model came up for sale on one of the Facebook groups in Mansfield but after going to view it and researching the model, I realised that it was not a genuine Sunrise model because Devon only introduced the Sunrise on later water-cooled models. Back to the drawing board! I think Jenny and I by this stage had given up hope of finding a van and our thoughts were that we would wait until spring 2019 to see what came up for sale then. We were in October already and hadn’t got any closer, so we were now prepared to wait. Shortly after, during a routine search online, I noticed that the Westfalia in Sheffield had been listed for sale once again, this time at a reduced price, but still more than our offer. I thought it couldn’t do any harm to contact them once again and let them know that our offer still stands. So, I emailed them straightaway and said that if they still want to sell it, we will come and buy it! A few days passed, so we thought they probably weren’t interested, but eventually they replied saying they will accept our offer! We met in the Peak District, half-way between Sheffield and Derbyshire, did the deal, filled in the paperwork, insured it with ClassicLine and drove the old bus home! We had eventually found our camper! It isn’t perfect but it’s all original and we intend to keep it as original as possible while bringing it back to its former glory. For specialist insurance on your VW Camper or classic VW, contact Christian and the ClassicLine team on 01455 639 000.